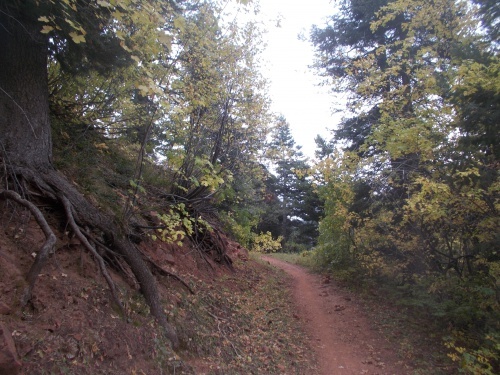 Another Long Walk: Day 34: The End of the Colorado Trail! September 27: When dawn arrived, I was surprised to discover that it hadn't rained or snowed during the night. Not a drop! Weather forecasts predicted rain/snow all night long and all day long, but clearly whatever storm was blowing in had been delayed. But! It still looked like it might rain at any time. I didn't for a minute think that it wasn't going to rain at all--just that the timing of the storm wasn't predicted well. But it still annoyed me to have set up my tarp and take it back down for no good reason. Temperatures were crisp and cool, but nowhere near as cold as they had been the previous two mornings. I laid around in my sleeping bag with little motivation to get going--even at the time thinking the delay would be a decision I'd grow to regret. 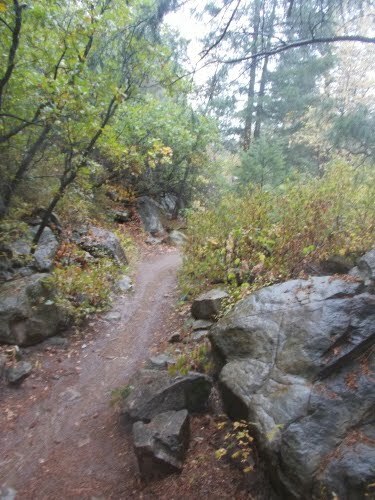 I was certain it would start raining and once it did, it wouldn't stop until I finished the trail. Every minute I delayed the day's hike was an extra minute I'd be in the rain. But I couldn't help it--I laid around for a half hour for absolutely no good reason at all. Eventually I got myself up and moving, and once I was on the trail I burned rubber! 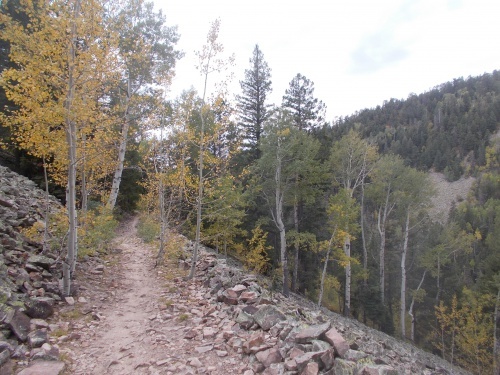 I had a small hill to get over--maybe 500 feet in elevation gain--but fresh in the morning with my pack low on food, I covered the distance quick. Then it was all a gradual downhill which was even faster. 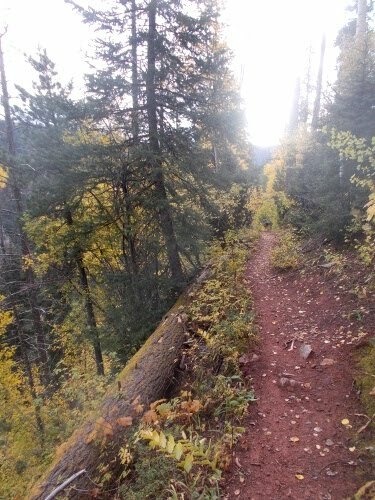 I blazed down the trail. I kept waiting for the rain, expecting it at any moment, but hour after hour passed and still no rain. I was delighted at the unexpected lack of rain, but suspicious. I didn't trust the weather. Not at all. 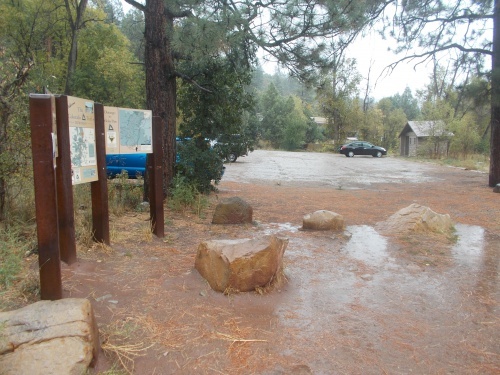 At Gudy's Rest, there's a commanding view towards the town of Durango. I was able to see some civilization in the distance. Durango, here I come! I also ran into a dayhiker who I chatted with for several minutes. Immediately upon meeting him, I thought he reminded me of someone but I couldn't think of who. But I passed it off as absurd. The chances of bumping into someone I knew out here seemed remote at best--unless it was other people I met while hiking on the trail and I knew this guy wasn't one of them. So I set that nagging feeling that I knew him aside and we chatted a bit. 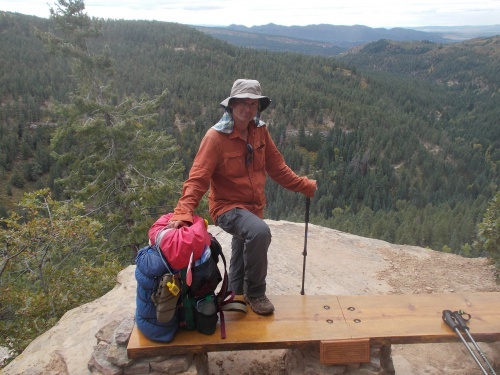 He was visiting the area from Cincinnati, and I told him about my Colorado Trail thru-hiker. 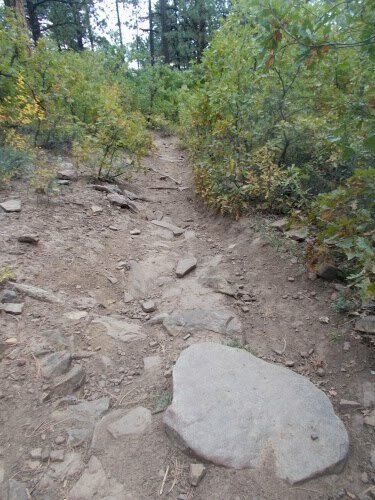 "Just 4 more miles and I'm done with this trail!" I exclaimed. We also talked about the weather. He too was surprised it wasn't raining but decided to make the most of it by doing a little hiking. I told him that I was absolutely ecstatic that it hadn't started raining yet. I had expected to hike the last 14 miles in a miserable, wet rain and so far, not a drop in 10 miles! Just four miles to go! 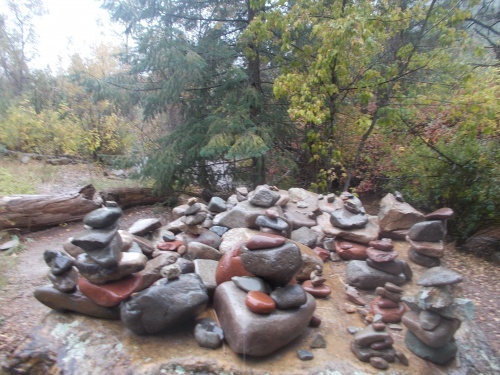 "Even if it started raining right now," I told him, "I'd be thrilled that I only had to hike in the rain for four miles!" As soon as the words came out of my mouth, I thought better of it. "I hoped I didn't just jinx myself," I said. 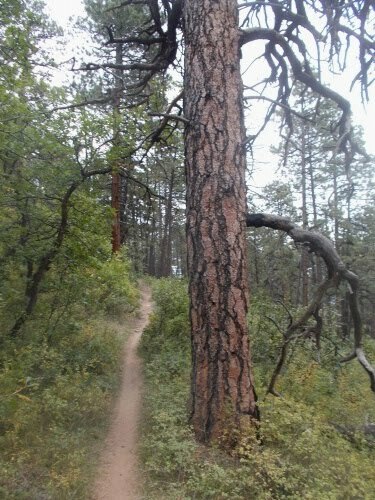 I hoped I could finish the last four miles of trail without any rain at all--it seemed possible now! But it's true--even if it did start raining right then, I'd still be happy that it didn't rain the first ten miles of the day. We parted ways--he was going to try hiking a bit further up the trail before turning back and I continued hiking. Not two minutes later, it started raining. I shook my fist in the air. I had jinxed myself! 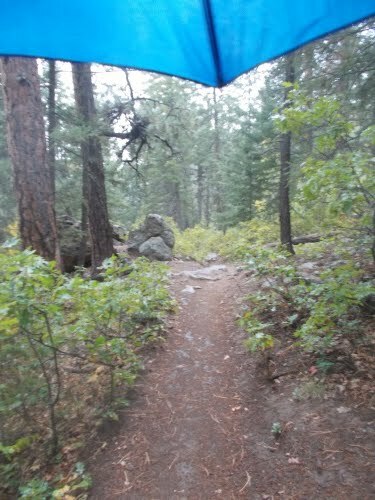 I pulled out my umbrella, wondering if the day hiker were cursing me for me for the jinx. And finally I remembered who the guy reminded me of: Henry Winkler. Even sounded a lot like him too. And I started thinking, maybe it was him. Even celebrities sometimes go outside to hike, right? How cool would it be say that I bumped into Henry Winkler while I was on my thru-hike! The man said he was visiting the area but lived in Cincinnati. Did Henry Winkler live in Cincinnati? It would make sense he might have a house in Hollywood, but celebrities live in other locations too. Off the top of my head, I had no idea where Henry Winkler called home. I wished I had asked about his name. Was it Henry? If I made a Happy Days reference, would he say anything about it? The light rain that started turned into a heavy downpour within a couple of minutes and--as expected--continued raining hard the rest of the day. It was miserable, wet and cold, but I was still thrilled that I finished the first 10 miles today with no rain at all. It was far more than I could have hoped for! This was, I also knew, where I was paying my dues for sleeping in the extra half hour. 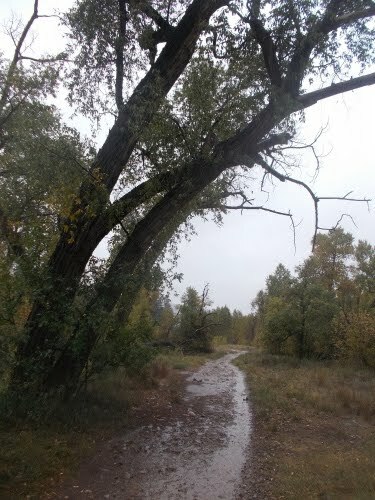 I wouldn't have reached the end of the trail in a half hour, but I'd be walking in the rain for the last 60-or-so minutes. Had I not slept in late, I'd have cut that in half! I still made good time the last four miles. 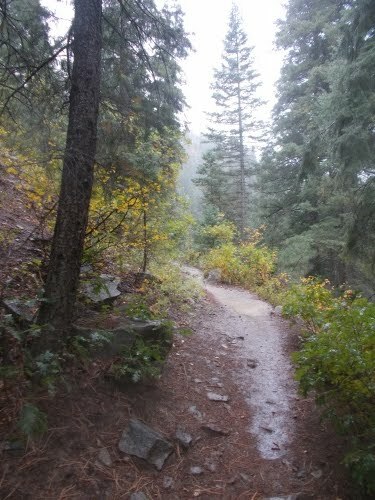 I slowed down a bit getting through some areas slippery with mud and through large puddles forming on the trail, but I still hiked quickly anxious to finish the trail and get out of the rain. 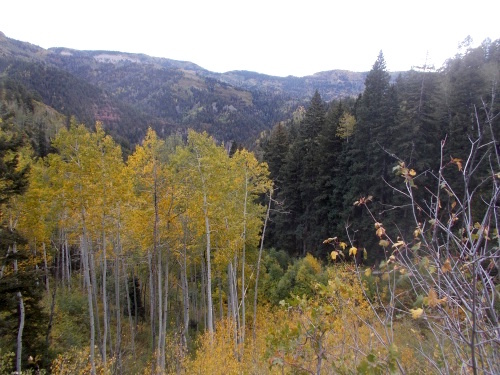 And about an hour later, I arrived at the southern terminus of the Colorado Trail. I could see the parking lot and knew that was it. The end. The grand finale! I made it! And it was immensely anti-climatic. 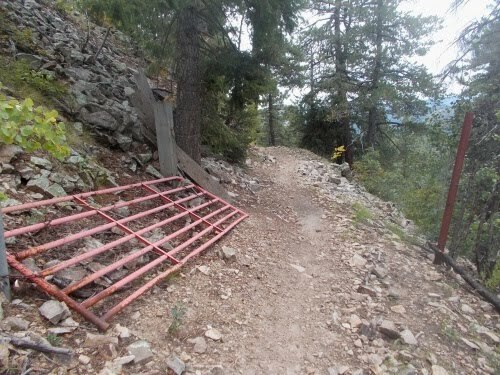 It looked like any other regular trailhead. 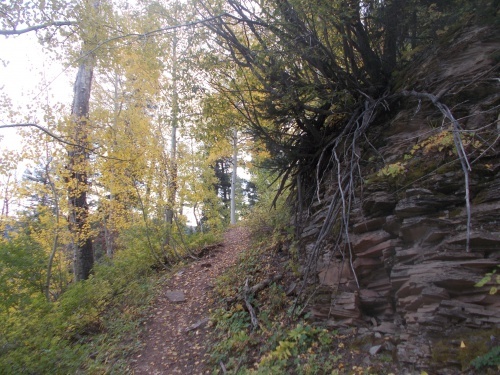 There was no grand monument or sign to mark the end of this epic trail. Nothing even particularly photogenic in the area. There were three cars in the parking lot. Given the torrential downpour, I didn't expect any new cars would show up anytime soon. It might be hard to hitch a ride out from here, but one problem at a time. Where was I going to take my great "I'm finished!" photo? 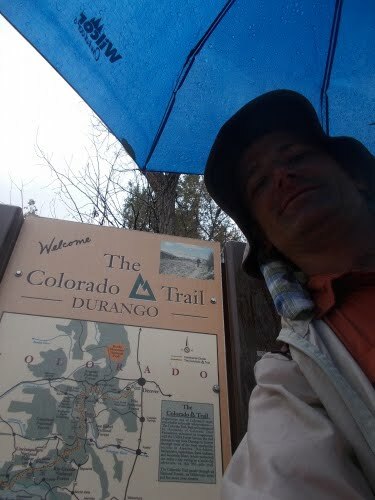 For lack of anything else, I took a selfie with the sign about the Colorado Trail behind me. It was immensely unsatisfying, and I was frustrated that nobody was around who could take a proper photo of me and the complete lack of an interesting background. There was an outhouse in the parking lot, and I walked over to it standing under the small 1-foot overhanging roof. It was, quite literally, the only place to get out of the rain. I found myself annoyed that the outhouse didn't have a larger roof with a longer overhang, but I made do with what was available. I pulled out my phone and texted a few people to let them know I officially finished the trail but didn't make any phone calls. That could wait when I was in town and out of the rain. Then I pulled up the maps of the area (downloaded earlier to my phone) to figure out how to get into town. Downtown Durango was supposedly only about 5 miles away, but it seemed like an insurmountable barrier. I even thought about calling a taxi, but it somehow felt wrong to have a taxi pick me up at the end of the trail. At the very least, I figured I should at least try getting to a busier road and hitching a ride. I could stand for an hour by this road and not see anyone, I figured! If it were a nice day, there might be plenty of hikers finishing their day hikes who'd give me a ride into town, but there was nobody around right now. I started walking out on the road. On my map it looked like there was a perhaps busier road less than a mile away. And, of course, if any cars drove by before then, I'd stick out my thumb at any point along the way as well. He popped his trunk and I threw all my gear in and then jumped into the car. Now that I had an idea of who he was, I took a close look at him without trying to be too creepy about it, and as far as I could tell, it really might be him. It's not like I've seen him a lot on television or anything--I'm not sure I'd recognize him at all except for the fact that I've seen him a few times being interviewed on the Tonight Show and such. I noticed the car rental receipt in the center divider of the car and surreptitiously read the name on it. Stephen. I was a little disappointed. Not Henry Winkler. Unless he was using an assumed name so his legions of fans didn't mob him at the airport? Or maybe.... no, it wasn't him. But dang, the resemblance was astounding! The looks, the voice, the attitude.... if there was a Henry Winkler look-alike contest, this guy would win! Steve (he later introduced himself as Steve) offered to drive me anywhere in Durango I needed to go--it's not a large town!--but I didn't have any reservations for lodging so I actually wasn't sure where to go. Just that I wanted to be somewhere near downtown where I could get a hot meal and pick up my maildrop. Then I could get online somewhere and figure out somewhere nearby that was cheap and had a room available. We drove into the main drag in town and I saw a Dennys up ahead. "Dennys usually has wi-fi, right?" I asked Steve. "How about dropping me off there?" It was located about a block away from the post office. I could get out of the rain, eat a hot meal, get online and find somewhere to stay, then walk over to the post office to pick up my mail drops and finally--go to my hotel room wherever it might be. So Steve dropped me off and I stepped into Dennys. I asked an employee there if they had wi-fi--I really needed to get online and find lodging and had absolutely no intention of eating somewhere where I couldn't get online--but they confirmed that it was available and was quickly seated. Sopping wet after hiking an hour in the pouring rain, I was also freezing. I really wanted them to crank up the heat in that place! I ordered the Philly cheesesteak and a Coke, then pulled out my phone and started looking for cheap places to stay. I settled on a hotel at the edge of town a mile or two away after confirming that there was a bus I could take to the location. I didn't want to walk that far in the rain to a hotel! I ate my meal, which was delicious, and after paying the bill, walked over to the post office where I picked up two packages. One from myself (my laptop and a few miscellaneous items) and one from my mom (a duffel bag so I could check a bag upon my departure). Those didn't fix in my pack which was still full with all of my usual gear, so I just carried the boxes awkwardly in my arms then walked to a bus stop which whisked me away to the hotel. At the hotel, life was good! I cranked up the heat to "high" and stripped off the wet, dirty clothes and took a long, hot shower. Life was good! I got online to figure out if there were any flights I could get on tomorrow morning. I didn't expect that the end of September was a busy time for travelers and was pleased to see plenty of available seats to choose from. 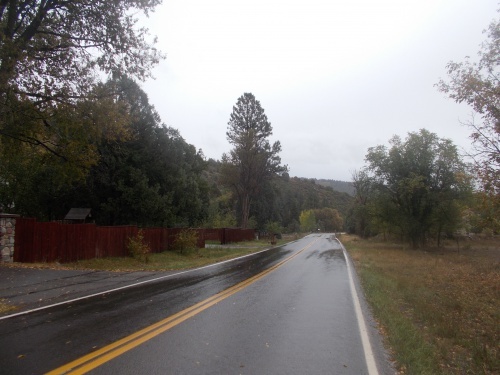 Then I looked into how to get from the hotel to the airport and was shocked--shocked!--that, as far as I could tell, there was absolutely no mass transit options from downtown Durango to the Durango airport. Not only that, but the Durango airport was something like 20 miles outside of town. What the heck? Later in the evening, I went next door and ate dinner at Taco Bell but that was it for me. My day--and my hike--was done! View from Gudy's Rest, just a couple of minutes before the rain would begin! The end of the trail was... immensely anti-climatic. Thanks for the great trip, Ryan! 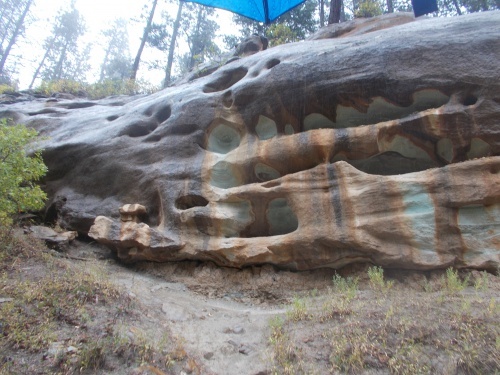 I loved this trail - and the excellent photos! Another wonderful story, Ryan! Can't wait for more of your adventures! I just read about the Cowboy Trail in Nebraska. Have you already heard of it? Always enjoy your trail posts. I'm glad you didn't violate rule #2 or rule #1 in spite of those cold nights and snowfall!